A Year's Meal Planner ~ Free for Subscribers! You know, the only problem I have with the foods I put up and preserve is that I deem them too expensive. Bear with me. I know that putting up foods saves money, but it is a lot of labor. A lot. Hours and hours worth. And when I finally finish putting up food, I feel like we shouldn't eat it. Unless it's a special occasion where everyone is dressed in black-tie attire. I remember last summer, the day after I finished putting up 37 quarts of corn, Jeremy said "Alright! 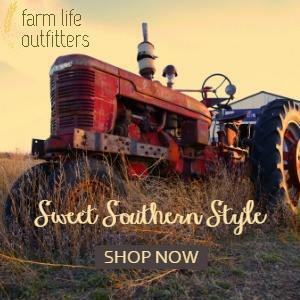 Let's have some corn!" I said, "nononono, it's special." He laughed about it until he realized I was serious. Then he asked when we would be able to to eat this special corn. I'm not going to plan each meal out, but I do want to have a record of what I have preserved so that each month I can plan our meals around what I have. And I want to space everything out on a monthly basis. I decided to begin my year's worth of menu planning in September. That's when our new school year officially begins, plus most of the harvest will be finished then. And I'll finish it in June, and hopefully we just eat all fresh foods in July and August. I made up these printables for me this year, and I decided to share them with you, if you'd like to subscribe to my newsletter! In case you didn't have enough cocktail dresses either. Great job with all the organization! I've seen many records of what people want to put up and corresponding menu plans, but I feel it's more feasible to see what you are able to put up first and THEN make plans like you are doing. I think this will serve you well :-) . I usually do this in my head, but then I never remember to use the foods every month. So this way I'll have my grocery list already planned for me, I just need to figure out the meals. I think it will work well! I totally hear ya. It's not easy to use up that food that took sooo long to put up! It's a different mindset, isn't it? Grocery store food is so much cheaper in my mind because it's easier. But you know, I also appreciate my foods more than grocery store foods. When we eat the foods we worked for, I feel like it's a miracle that we have food on our table. Anyway, sorry to get all deep on you! I'm glad I'm not the only one! Thank you. Does it make sense if you have to shop at the grocery store? I'm in the city! Hi Susan! I still have to shop at the grocery store too, but this planner is to keep up with and divide the foods I preserve so that I'll eat them before buying stuff at the grocery store. 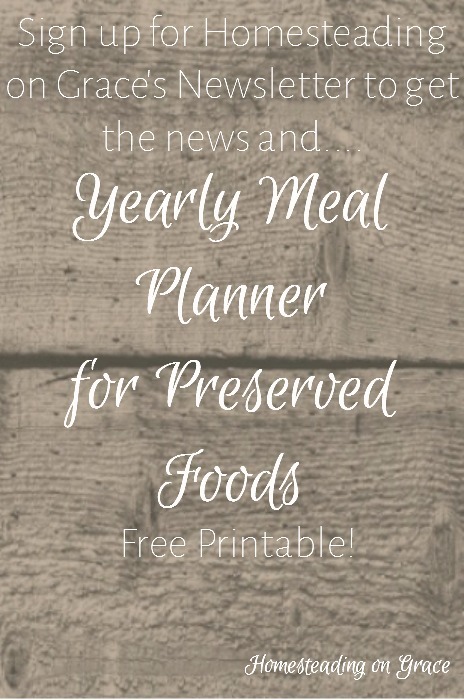 If you preserve, can, freeze, or even bulk shop, I think the planner will be helpful! And thanks for the invite, I'll come check you out! What an excellent idea, I'm like you and don't like to use my canned produce either but you have encouraged me to spread it out and be aware of what I have. Thanks for sharing this at Good Morning Mondays, Blessings. I am the same way!!! My husband claims my pantry of home canned foods is a museum :) It is hard to let those jars go! But, in the end, practicality wins out. Thank you for sharing this idea on the Art of Home-Making Mondays! 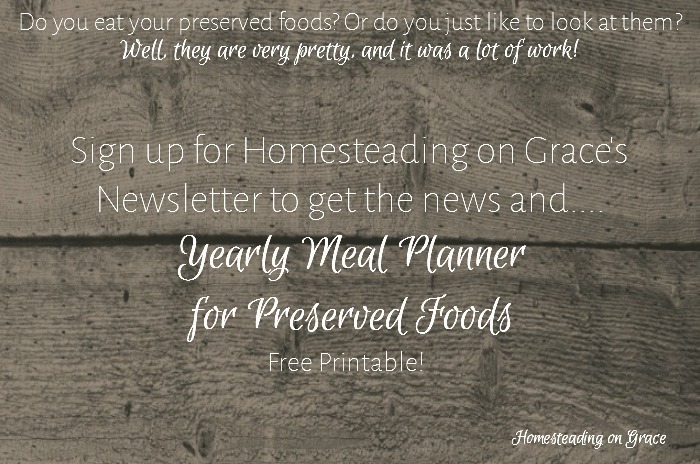 Jennifer - wondering how I can get the yearly meal planner? 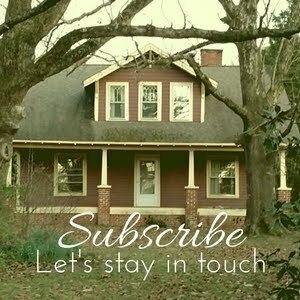 I'm a subscriber, but have not received this? Can you email me? homesteadingongrace@hotmail.com I'll fix it!